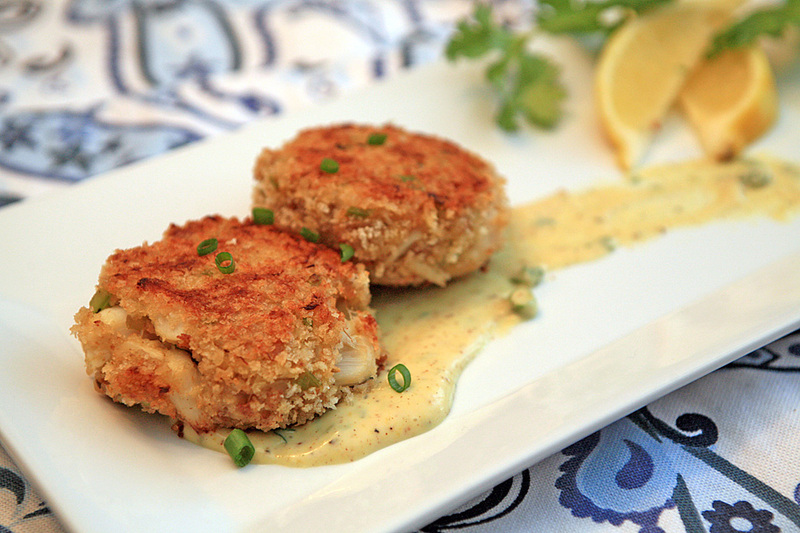 This easy crab cake recipe is bursting with chunks of crab meat and tons of fresh flavor. Turn these beauties into bite sized crab cake balls and serve them as an appetizer for a cocktail party, baby shower, bridal shower or holiday celebration. Let’s not forget about the amazing spicy mustard sauce! You’ll be looking for reasons to use this sauce in other recipes. We think it also pairs perfectly with our Chicken Caprese Skewers. In a small skillet over medium heat melt 1 tbsp. of butter. Add in onion, celery, scallion and garlic. Season with salt, pepper and Old Bay. Stir and cook until the vegetables are tender. Remove from heat and set aside. In a medium prep bowl add the bread, heavy cream and a pinch of salt. Set aside for 5 minutes. Once the bread absorbs the liquid, add the veggies to the bowl. Stir to combine. Add the egg, crabmeat and lemon zest, stir to combine. Scoop mixture into balls. Pour panko breadcrumbs into a swallow dish. Toss the crab cake balls into the breadcrumbs, turning to coat. Place the crab cake balls on baking sheet lined with foil and refrigerate for 10 minutes. In the skillet that you used to sauté the veggies, melt the remaining tbsp. of butter. Slightly flatten crab cake balls and add to the skillet (4 at a time). Brown on each side for 2-3 minutes. Transfer crab cakes back to the baking sheet and bake for 30 minutes, until golden on all sides. Serve with our spicy mustard sauce, a garnish of chopped scallions and sliced lemon. Add all ingredients above to a small prep bowl. Mix to combine. Chill for latest 30 minutes prior to serving to allow the flavors to combine.